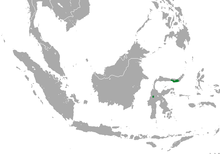 Small-toothed fruit bat range on Sulawesi. The small-toothed fruit bat (Neopteryx frosti) is a species of megabat in the family Pteropodidae. It is monotypic within the genus Neopteryx. This fruit bat is endemic to central Indonesia. It is known only from two localities on Sulawesi island. Its natural habitat is subtropical or tropical dry forests. It is an IUCN Red List Endangered species, due to continued habitat decline and intense hunting. ^ Tsang, S.M. (2016). "Neopteryx frosti". The IUCN Red List of Threatened Species. 2016: e.T14560A115122474. doi:10.2305/IUCN.UK.2016-3.RLTS.T14560A22032953.en. This page was last edited on 21 February 2019, at 07:19 (UTC).